C pillar on the hatch is looking thicc but I'm still digging it. Interior looks fantastic as expected. Can't wait to find out more about the engines. Mazda CEO just mentioned AWD on the live stream! Dumb observation but did they change the typeface of the trunk badge? Looks like the Skyactiv-X engine won't arrive until "later next year." SkyActiv-X engine won't arrive until the end of 2019 so likely not until the 2020 model year. The 2019 models will carryover the existing engines. Not digging the switch to torsion beam for the rear suspension. 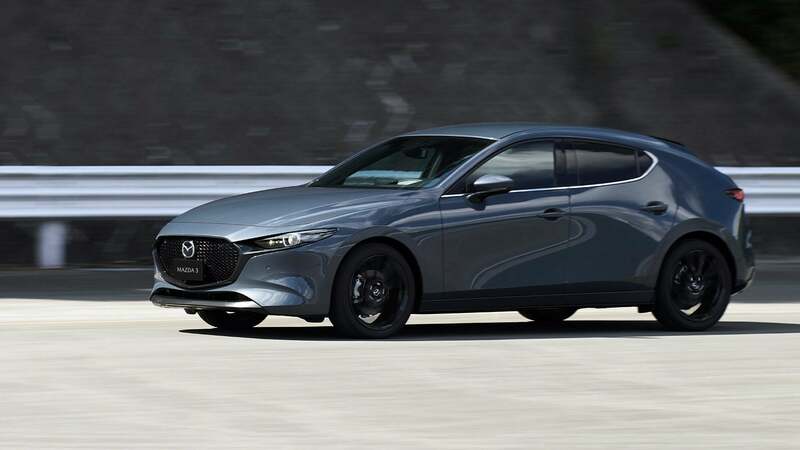 I'll give them the benefit of the doubt until we see first drives, but seems like a very un-Mazda thing to do. 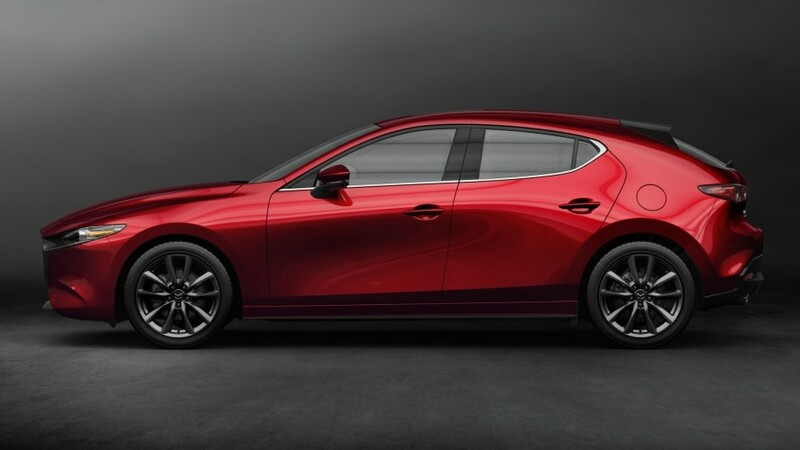 178hp/164lb-ft for the new SkyActiv-X engine. That picture is awkward because you can't see that the rearmost part of the roofline is blacked out. It's more apparent in another color or different lighting, and makes the C-pillar look not as thick. Just confirmed it via my inventory search dropdown menu. 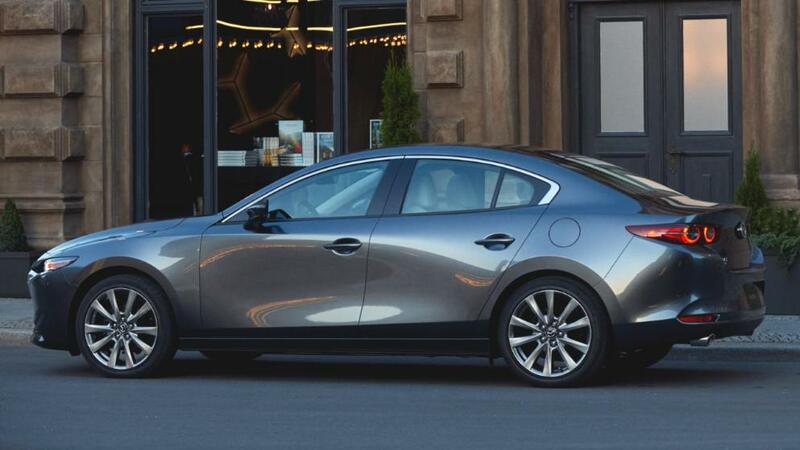 The chrome trim at the C-pillar and the tail-lights is reminiscent of the 1st gen mazda 3. I'm glad they sorted out the door handle placement. The body lines flow more straight from the hood from the trunk, creating a stronger identity line to place the handles in. The prev gen 3 had a swoop that fell down near the front door and a swoop that began up from the middle of the rear door. it works well on a larger car (The design language translates much better on Mazda 6 than the 3). Coming to dealers with more wheel gap than is shown on promotional products, probably. Add heavier steering and more sound deadening and I may consider a Mazda 3 in the future. The 3rd gen was a disappointing experience for me, but not for the reasons you might think. Thank god you aren't the arbiter of good taste. I like how the sedan also has dual exhaust tips now. Sedan looks to drop the manuel completely. There is no Sport trim on the hatch. AWD will be offered on both sedan and hatch in both Touring and Grand Touring trims. Manuel is Grand Touring hatch only. Colors on the hatch will be the following, with either black or red interiors on the Grand Touring, and black and grey on the touring. Colors on the sedan will be the following, with either black or white interiors on the Grand Touring, or black and grey on the touring, and only black interior on the sport. Sport trim will be limited to only Deep crystal blue, Snowflake white, Jet black, and Sonic silver exterior colors. Obviously things are subject to change, but I've confirmed that the AWD will be auto only. That is 100%. So it looks like Mazda US has effectively phased out the manual transmission in the US. I hope Mazda Canada provides more trim levels for the manual. They've just doubled down on the trim that has been most popular with manuel. We traditionally have a tough time moving Sport and Touring manual 3s - most manuals we sell are Grand Touring trim cars. My 2015 3 was a GT hatch with manual. Was the manual similarly restricted for the 3rd gen car, or have they just determined that most people who wanted a manual got the higher trim? Interesting. Edit - Just saw the above post. Makes sense. Somehow I just don’t believe it. The manual sold well in Touring trims too. I don’t think whatever Zillion saw is final. No manual in the Sedan seems unlikely. And what's the word for Skyactiv X? I'm in the market late next year and I'm interested if the specs are right. Manual in the sedan is dead. Just confirmed it.